The German Grand Prix on Sunday felt a lot like a soothing balm on the sport's troubled self. After considerable recent acrimony, that we all know about, the race was exciting and variable, and provided exactly the sort of action that the current formula is designed to. 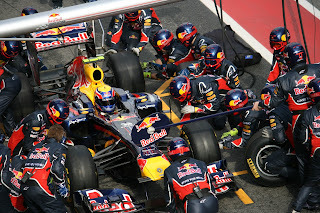 There was however one false note, when Mark Webber was released by his Red Bull crew after his first pit stop with his right-rear wheel not attached, and the wheel flew towards those standing in the pits to hit a cameraman at sickening speed. Thankfully and mercifully his injuries at the time of writing seem light. It's inevitable, and entirely honourable, that after such incidents changes will be sought to reduce the probability of it or similar happening again. But equally knee jerk response, and changes for the sake of changes, should be avoided. The sport of course has come a long way in terms of who is and isn't allowed into a 'live' pit lane. One thinks of the 1974 British Grand Prix, wherein Niki Lauda made a late stop to change a punctured tyre, to find that he physically could not rejoin the race as various somebodies had gathered at the end of the pit lane to get a view of the finish, and literally blocked the way. These days pit lane access is severely restricted, befitting that it's a dangerous place even in our post-refuelling age. And given this inherent danger such incidents sadly can probably never be totally ruled out. We already have a rule wherein pit crews are only allowed out into the pit lane if a stop is imminent, though that can have limited effect when, as is often the case, pit stops are clustered. A reduction of the pit lane speed limit in a race also comes in for 2014, though in a situation like this it's doubtful that would have made a difference. One thing I hope we don't get as a consequence of Sunday is restricting the number of crew available in a pit stop, as in the case in Le Mans and Indycar. I'll admit that I adore the modern F1 pit stop, as it is a wonderful poetry-in-motion spectacle, as well as find the efforts to shave hundredths of a second off their time fascinating, and exactly in keeping with whatever F1 is. I always think pit stops with restricted numbers look terrible, amateurish, and in any case they beg the question in that it's not clear the extent if at all they'll reduce errors, which are the root of the problem (it at least would mean there are fewer people to be struck by errant wheels though). For similar reasons I also hope we don't see Le Mans-style minimum pit stop times. There have already been suggestions that camera crews will be restricted to the pit wall only and not permitted in the lane itself. Yet as Will Buxton noted, had it been Webber's left-rear not attached properly that it could just as easily been the pit wall that the wheel was projected towards. Martin Brundle made a good point during the commentary that perhaps the FOM camera could have been fixed, and operated remotely rather than by a man standing in the pits. Additionally, next year a rule comes in for all of the pit crew to wear head proetction; perhaps it could be extended to all in the pits (as is the case in Le Mans), but nevertheless in the specific case of Sunday's incident it's unlikely a helmet would have helped. Perhaps though some of our focus should be on doing more to change behaviour, and seek to ensure more care is taken in the stops themselves and in releasing cars from them. It seems that recently the 'unsafe release' has all but been struck from the rule book. Only if it results in a collision it seems, as it was for Nico Hulkenberg in Spain, does it get a substantive in-race punishment. And so it was in Germany, wherein Red Bull got but a €30,000 fine for releasing Webber's car without the rear wheel attached, while Force India got just €5,000 for releasing Paul Di Resta into the path of Jean-Eric Vergne. Both seem paltry punishments, not a deterrent at all to push the boundaries, particularly when compared with the more substantial penalties such acts got up until recently (especially in the latter type of case) when a drive-through at least could be expected. Indeed, in 2010 a rule was brought in for a minimum number of car's lengths before any approaching car being required when releasing a car from the pits, but it seemed forgotten about almost immediately. None of it sends a message of a sport wanting to crack down on such matters. And while no one's suggesting for a second that either team did what they did deliberately on Sunday, however inadvertent when you do bad there has to be consequences - that’s life. And especially so when the outcome of your doing bad is so potentially catastrophic. I think the 30K fine is ridiculous. Mateschitz would laugh at it. These wheels can kill, and if I were in charge, there would be grid penalties for teams who let a wheel go loose. This would make the lollipod guy way less aggressive. Remember Rosberg in Suzuka 2010 or 11, his wheel flew so high near Dunlop, it was a lethal weapon.